Several internet posters have determined that he was the son of Hans Martin Keller (1682-1732) and Margretha Loscher (1684-1737) who were married 14 January 1698 in Schwaigern KB, Weiler, Germany. Their son Carl was born 14 April 1702 according to church records. By the late 1740s he was living on the frontier a considerable distance to the southwest in what was then Frederick County, Virginia and is today Mineral County, West Virginia. By 1747 about two dozen families had settled along Pattersons Creek, a fifty-mile long creek emptying into the north branch of the Potomac River. In early 1748 Lord Fairfax employed James Genn, a surveyor of Prince William County, to develop a survey map of the settlements preparatory to the issuance of land grants. Genn produced his survey in November 1748 — a portion of which is reproduced below. Charles Keller’s survey — known as Lot 16 — was 300 acres on both sides of Pattersons Creek surveyed in November 1748. 6 The plot was known as Lot 16 and was bisected by Pattersons Creek about four miles up the creek from the Potomac River and roughly at the location where the local road alongside the creek turned west toward what would later be Fort Cumberland. He never completed the grant process but the land was finally granted in 1779 to his son John Keller. 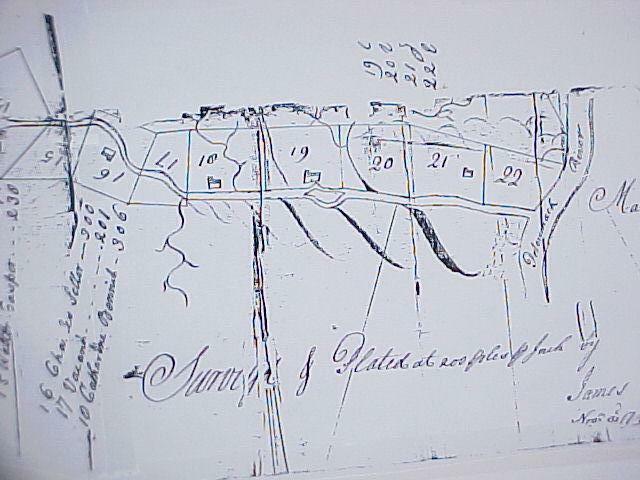 A portion of James Genn’s November 1748 survey map of Pattersons Creek. The two forts can be clearly located thanks to Genn’s 1748 survey and a 1754 map. The Fry-Jefferson map of Virginia (see below) which surveyed the area sometime in 1754, before the forts were built, shows “Pattisons Creek” running northeast into the North Branch of the Potomac River. Sellars plantation is not shown on the map, but McKrackens (on Lot 17) and George Parker’s plantation (on Lot 1) are shown at key points on the roadway from Winchester that turned down the creek before heading west to Fort Cumberland. James McCracken had been killed by Indians in late October 1755 but Charles Keller (“Sellars”) was evidently alive when the forts were constructed. The “Fort” on the map is apparently the predecessor to Fort Cumberland. 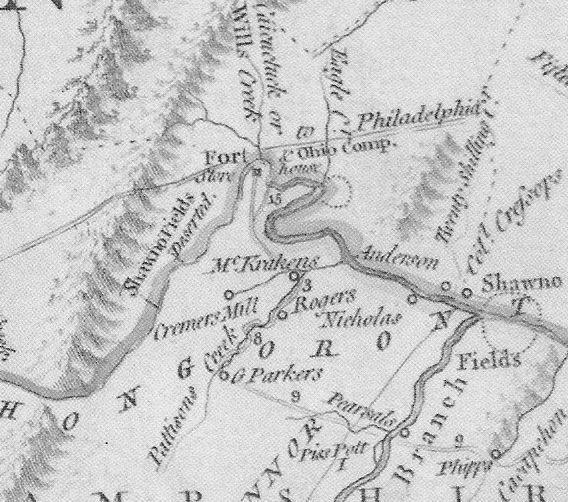 In the lower right is the site of Fort Pearsall on the South Branch of the Potomac. There was also a small fortified storehouse at the mouth of Patterson’s Creek on Lot 22, which has sometimes been erroneously referred to as “Fort Sellers”.13 Just off the map was another fort called Fort Keller located in what is now Shenandoah County. Both of the forts on Patterson’s creek were abandoned in April 1757, the settlers having left the area, when Washington ordered their garrisons to move to the South Branch of the Potomac to protect settlers there.18 By then Captain Ashby had retired and the Rangers had been disbanded. The fort was subsequently used sporadically, but it doesn’t appear to have seen use after the close of the war in 1764. Examination of the original handwritten documents show that Col. George Washington, Col. Adam Stephen, and Lt. Thomas Rutherford all very clearly wrote the name as “Seller” or “Sellar” rather than “Keller”. And James Genn’s 1748 survey (see image above) appears to show the name as “Charles Seller”. The grant for that survey, however, was issued to John Keller, son and heir of Charles Keller. And the 1749 road order refers to him as “Charles Keller” as well. I can’t explain this discrepancy, unless Charles Keller pronounced his name in a way that caused Englishmen to write it with an “S” rather than a “K”. Or perhaps he simply couldn’t decide whether or how to Anglicize his surname. I note that something similar seems to have occurred with the name of Charles Keller’s cousin George Keller, whose name was on several occasions recorded in Frederick County record books as “Seller”. And Charles Keller’s son John Keller was recorded as “Sellers” in the 1782 and 1784 state censuses, as well as in other documents. The petition to establish the town of Frankfort spelled his name as “Sellers” while the town charter barely a month later spelled it “Keller”. All of the deeds for lots in town spelled it “Keller”. To add to the consternation, he signed the 1787 petition as “john Sellars” but signed two petitions in 1792 and 1793 as “john Keller”. The French and Indian war, had reached the area in 1755 and Indian attacks killed many settlers along the western reaches of the Potomac. Charles Keller is said to have been killed by Indians in 1756, although I could find no contemporary record of it. There are, however, numerous accounts of the murders of other settlers in the area in 1755 and 1756, sufficient to temporarily drive many residents away from the area. One of the earliest records of his death is a statement made by a grandson, also named Charles Keller, to the author of an 1833 history that “Near [Ashby’s]Fort, Charles Keller was killed.”19 No date was given in that account but later, when his death was reported in several subsequent histories of the area, the year 1756 was added. That date appears to be likely, given the implication by Lt. Rutherford’s muster reports that Keller was alive in January 1756. His family must have taken refuge back in Lancaster County. The 1758 poll list for Frederick County listed no Sellers and only one Keller — Charles Keller’s cousin George Keller who lived in the part of the county that became Shenandoah — as voters. Northeast of Fort Ashby is a West Virginia historical marker commemorating “Fort Sellars” There is an historical maker for Fort Sellars “On land Washington surveyed for Elias Sellers in 1748.” This appears to be an historical error, perhaps generated by a family legend gone wrong in the retelling. The earliest mention of it in print that I found was a 1906 history that referred to a fort at the mouth of Pattersons Creek called Sellers Fort or Elias Sellers Fort, said to have been built on land surveyed for Elias Sellers on 1 April 1748 by George Washington. 20 This claim was repeated in subsequent publications, including Myer’s History of Virginia in 1915. But it is based on faulty information. George Washington did assist James Genn in a survey on that date for land on which an Elias Sellars was living, but the surveyed land was fifty miles away on the south fork of the Potomac. (The only 1748 survey at the mouth of Pattersons creek was made by James Genn in November 1748 for Phillip Martin, to whom Lot 22 was granted.) No one named Elias Sellers seems to have ever lived anywhere near the mouth of Pattersons Creek. Nor does the name “Fort Sellars” appear anywhere within the George Washington Papers. Indeed, the stockade at the mouth of the creek was evidently not given a name. According to the Washington Papers it was a stockade protecting a storehouse at the mouth of the creek, built shortly after the nearby forts at Seller’s and Parker’s plantations. The Indian depredations of the French and Indian War appear to have delayed grants in the vicinity of Pattersons Creek after the initial 15 grants of 1748 and 1749. Only two patents were issued for land along the nearly fifty-mile creek over the next sixteen years. Why Charles Keller’s patent was not issued along with his neighbors in 1749 is unclear, although the death of his neighbor McCracken apparently delayed the grant of Lots 17 and 18 until 1766. On 1 June 1779 Lord Fairfax granted to “John Keller of Lancaster County in Pennsylvania, son & heir at law of Charles Keller dec’d” the 300 acres on Pattersons Creek known as Lot 16 — which was by then in Hampshire County — “bounded by a survey thereof made in November 1748 for the said Charles Keller by James Genn and forfeited by virtue of one advertisement issued from my office & recorded therein in Book N but another application of the said John Keller I have allowed.” 28 The survey was for a square parcel of 300 acres on both sides of Pattersons Creek. 139 acres, apparently the portion on the east side of the creek, were used by John Keller to lay out the town of Frankfort, more or less on the site of Ft. Ashby, which was charted by the Virginia General Assembly in 1787. For some time Frankfort was a booming town, being located on the busy road between Winchester and Wheeling. The post office later renamed the town “Alaska” and it is now known as “Fort Ashby”. John Keller (c1744 – 1805) The Fairfax grant establishes that he was the eldest son. He may have been the “John Sellers” enumerated in the 1782 and 1784 state censuses. 29 As noted above, in 1787 he was among the petitioners for the town of Frankfort, which was laid out on his land later that year. He died in 1805 while living in Frankfort, leaving seven minor children and a married daughter.